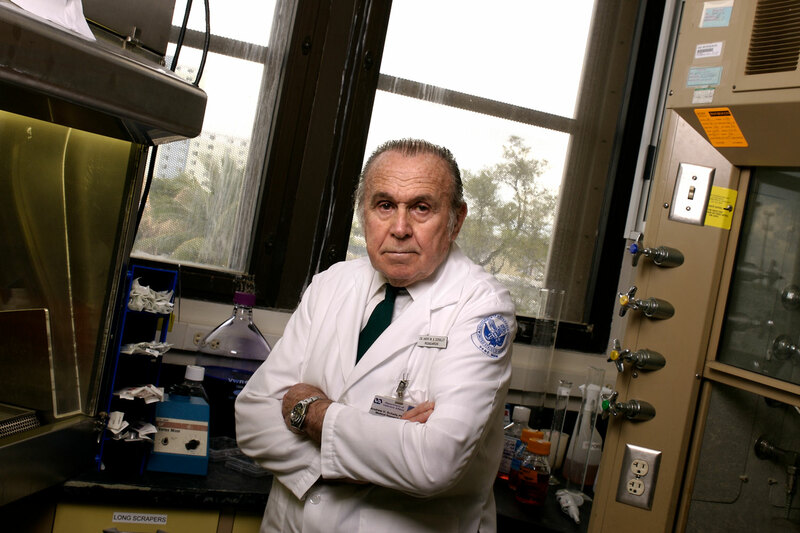 Nobel Prize winner Andrew V. Schally, Ph.D., M.D.h.c., D.Sc.h.c., professor of pathology and medicine at Sylvester Comprehensive Cancer Center and the Miller School of Medicine, and his team of research scientists at the Miami Veterans Affairs Healthcare System showed that a synthetic compound based on a brain hormone spurred the growth of cancer cells in Petri dishes but had the opposite effect in live mice. Andrew V. Schally, Ph.D., M.D.h.c., D.Sc.h.c. The discovery, reported in the Proceedings of the National Academy of Sciences (PNAS) on Nov. 20, holds promise for cancer treatment. It is also significant because the human-made compound and others like it spur the growth of healthy tissue, showing beneficial effects in preclinical studies to treat a range of medical conditions affecting the heart, pancreas, eyes, and other organs. Tests in animal models suggest, for example, that the compounds could help grow new heart muscle cells after a heart attack. The compound tested in the new PNAS report, MR409, is one of several patented analogs, or derivatives, made in Dr. Schally’s lab based on growth hormone-releasing hormone, or GHRH. GHRH, which is made in the brain’s hypothalamus, triggers the production and release of growth hormone in the pituitary gland. Growth hormone, in turn, is essential for human growth and cell regeneration. But Dr. Schally and his colleagues were worried that while GHRH analogs might be effective medicine for some conditions, they might also cause cancer cells to grow because of their growth-stimulating properties. That’s what MR409 did when applied to cell cultures in the latest experiments: It caused lung cancer cells from human tumors to multiply and spread, and kept them from dying. However, the hormone analog had the opposite effect when injected into mice with implanted human tumors: Not only did it not feed the cancer cells, it also stopped them from growing. It had this effect on lung, pancreatic, gastric, bladder, prostate, breast, and colorectal cancers. The analog, paradoxically, worked like counterpart analogs known as antagonists that are designed to block, not mimic, the action of GHRH. Agonists are analogs that act like a key in a lock to initiate a biochemical reaction in the body. The lock is a receptor — a protein on the cell surface that interacts with the agonist to trigger a reaction. Antagonists, on the other hand, jam up the receptor so no reaction can occur. GHRH antagonists have been tested extensively by Schally’s group and others for their ability to inhibit tumors. Dr. Schally believes the most likely reason for MR409’s tumor-inhibiting effect in mice is the down-regulation of GHRH receptors in the pituitary gland and in the tumors themselves. That effect, which can occur only in live animals and not in isolated cells, may explain the dramatic difference between the analog’s effect in cells versus in the organism. He notes that the receptor-squashing effect is like that seen with luteinizing hormone-releasing hormone (LHRH), which, like GHRH, is produced in the brain’s hypothalamus. A treatment for aggressive prostate cancer that is based on LHRH agonists, stemming from Schally’s early discoveries, was introduced in 1984 and is used widely. Dr. Schally says the down-regulation of receptors that results from continuous treatment with analogs is like a lock being worn out, so that turning the key has no effect. Dr. Schally’s journal article is accompanied by a commentary by Drs. Hippokratis Klaris and Ioulia Chatzistamou of the University of South Carolina. They write that MR409 and similar GHRH agonists, given the “virtual absence of toxicity” seen in experiments, should have “wide effectiveness in diverse cancers” and also hold promise for other diseases and conditions. GHRH agonists must still be tested in clinical trials in the U.S. before they can be used in routine patient care. That can take several years, but Dr. Schally, who won the Nobel Prize in medicine or physiology in 1977, says he is optimistic given his team’s latest results. “I’m not a clinician, but now I have no reservation in recommending the agonists for various clinical uses,” he said. In terms of cancer therapy, he says the insights gained in the latest study will benefit the further development of not only MR409 and other GHRH agonists, but also GHRH antagonists. He envisions clinicians eventually being able to choose between GHRH agonists and antagonists for cancer treatment.